Not many people realize what it's all about. Mention the Amazon to anyone and most folks think of Mosquito-ridden, snake-infested bogs and swamps. It couldn't be any more different. We fish in pristine, tannin-blackwater rivers, crystal-clear, roaring whitewater rivers, big lagoons with huge trees surrounding them and with such a hugely diverse watershed, we can offer any type of fishing to anyone. 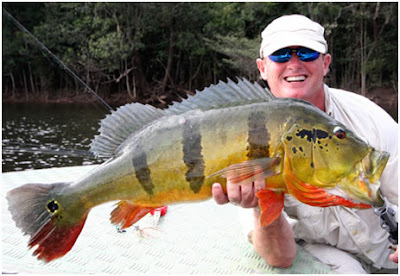 With over 2,500 documented freshwater fish species to date, quite simply, the Amazon offers the richest and most diverse, spectacular freshwater fishing anywhere in the world! The three-bar Cichla temensis Peacock Bass is the most well-known sportfish here and is a true adversary in every aspect. Similar to the American Largemouth Bass in shape but by no means in size, this wonderful fish will stretch your string to the limit. Even when using 80lb braided main line, they can break line just with the topwater strike! Better known for their tremendous topwater action, they are also caught on sub-surface lures and jigs and by flyfishermen also. These fish reach an impressive 30lbs with an average size of 10-15lbs. There are at least 15 Cichla Peacock species and the list grows each year. The colouration of these fish is spectacular, yet another bonus in catching them. The all-silver Payara, being a slash and grab specialist is probably one of the fastest and acrobatic freshwater fish in the world and a big fish can easily strip off 100m of line in seconds. This silver missile is also known as the Vampire or Dracula Fish and has an impressive set of gnashers worthy of its name. Two massive sabre teeth in the bottom jaw disappear into conical nasal cavities in the top jaw. They nearly always strike fast and furiously from underneath and grab any unfortunate fish in its path. Lures, flies, livebait and even fish strips will entice this amazing predator. 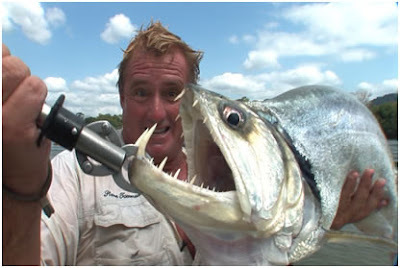 Average sizes for these 'Salmon-with-teeth' is 12-18lbs. Traiarão or Wolf fish are big, dark, sinister predators that lurk in slackwater or behind rocks and in eddies in faster current waiting for any baitfish to enter its territory. They will literally blast a topwater lure like a Spook or Popper with abandon and are true dirty fighters. They live in the same waters as Peacock Bass and Payara and are caught with many similar methods. Even a 20lb fish is just huge in size with its tubular shape and large, wide fins. It is the real bully of the Amazon watersheds and grows to an impressive 40lbs. The strange-looking, Pike-like Bicuda is a pointed-beaked, elongated fish that can reach 15lb fish and get to over 1.25m long, with a beautiful red/orange tail and a gold/silver body. They take smaller lures and flies in their serrated teeth-filled mouths with abandon and will leap and twist until finally landed. Not to be left out of the impressive list of fish on offer, the most infamous of them all, the Piranha has to be included on our hit list. With many different species here, the largest is the Black Piranha. With big bulldog jaws filled with an impressive array of triangular razor-sharp teeth, these fish are what nightmares are made of! Although we swim all over, there are some deeper haunts we simply just stay clear of. We catch these brutes to over 9lbs! Yes, 9lbs slabs of big, muscular Black Piranha. We use these fish for cutbait strips and chunks for Catfish and other species and also cook them up for a shore lunch on a home-made wood BBQ. They are just so big and easily destroy lures. Many times we hook them using huge circle hooks and cutbaits meant for Cats of over 200lbs! 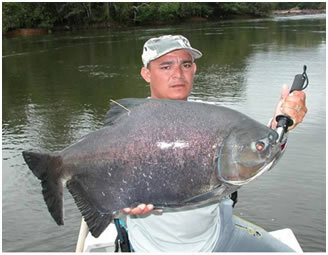 Click on the Piranha video on our video section: http://www.amazon-angler.com/ to see an average-sized one! Pirarára or Redtails are like giant Tadpoles with bright red tails, hence the name! 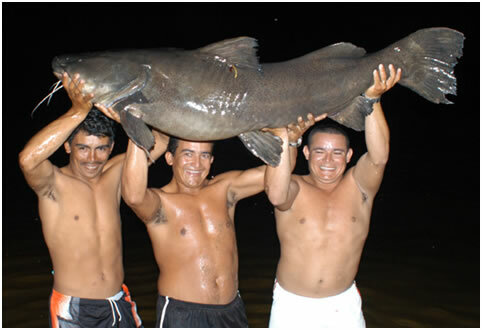 They are some of the strongest fish in the Amazon and can spool you in seconds. They grow to over 250lbs. Jandia are the chicken of the water and stewed, grilled or fried, they are quite simply the best tasting fish you will ever encounter in freshwater. For a Cat, it's a pretty fish with honey-combed orange/brown body and fin markings and a perfect-sized table fish is around 20-25lbs. Jau Cats are like the Amazonian Rottweillers on steroids. Big and ugly and marbled-coloured like the European Wels Cat and with a real mean attitude, they can also strip your reel bare in seconds. They love fast deep water and are often caught below waterfalls and cascades in water over 30ft deep. They reach over 100lbs in some rivers. 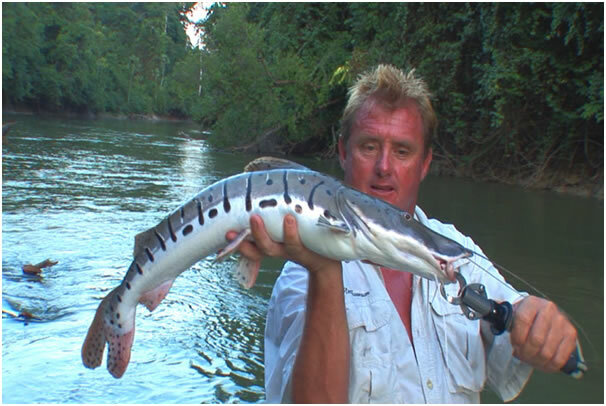 Surubim or Striped Tiger Cats are mostly pack hunters and are some of the Amazon's fastest predators and will often be caught on minnowbaits and jigs/flies. With silver/white bodies flanked with beautifully hiroglyphic markings, they are the camouflage experts of the waterworld. They are more often caught on small cutbait chunks in sandy, shallow areas and can reach over 100lbs. 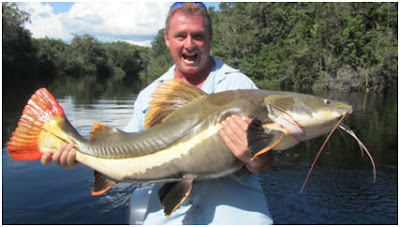 The King of Kings, the massive Piraiba Catfish is the one that everyone wants to catch. Known to reach over 600lb, an average Piraiba is over 100lbs. This fish is like a shark with long whiskers! They can often be seen breaking the surface like dolphins while hounding large baitfish but are found mainly in deeper holes and sluggish water. 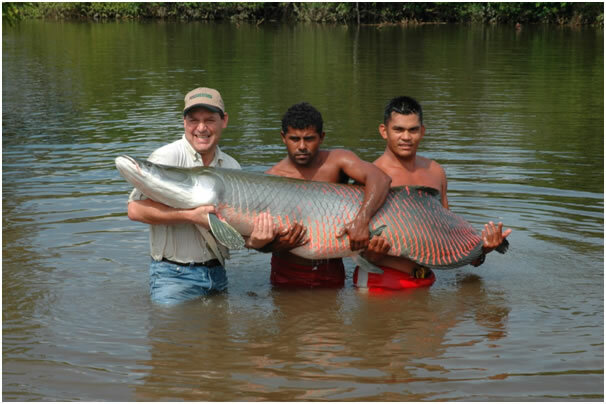 Another strange but impressive fish is the Pirarucu or Arapaima. 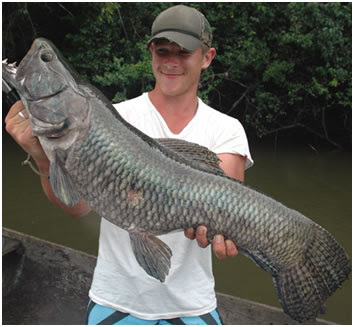 This enormous-growing fish is threatened throughout the Amazon Basin. Their downfall is that they are air-breathers and give themselves away all too easily each time they break the surface to take a gulp of air and are therefore harpooned easily. Although rarely fished for as sportfish, they are spectacular fish to catch. They can reach 1.75m and 100lbs in 5 years and grow to well-over 500lbs. Targetted using cutbait, lures and flies, once hooked they will jump like a Tarpon and never give up. They are incredibly strong and muscular and even when landed they can easily give you a broken jaw or leg with a good headbutt or a slap with their huge bodies unless held properly. 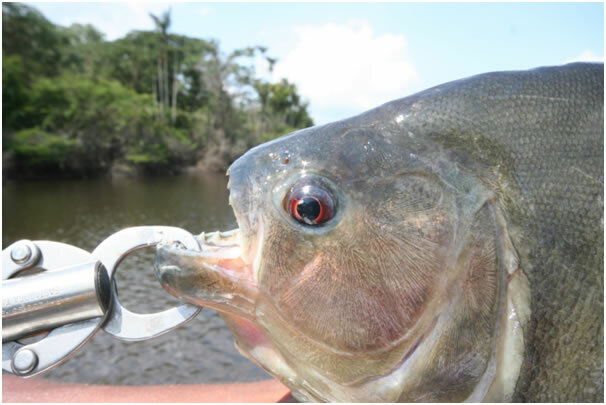 Although we do fish for them in Brazil, we are presently negotating to sportsfish for these beautiful creatures in a remote river system in Bolivia and only accessible by floatplane. There is also an enormous list of 'coarse' fish to be caught here ranging from a few ounces to over 50lbs! 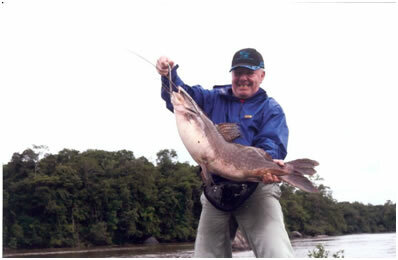 Any angler used to 'bagging' 100lbs of fish in the UK could easily exceed this amount in a day. There is no other place that has such a variety of colourful scaled fish readily taking small baits, nuts, fruits, grain, worms, fish strips etc. Nowhere else on this planet is there such a diversity of wildlife. It is literally all around you, everywhere you go. 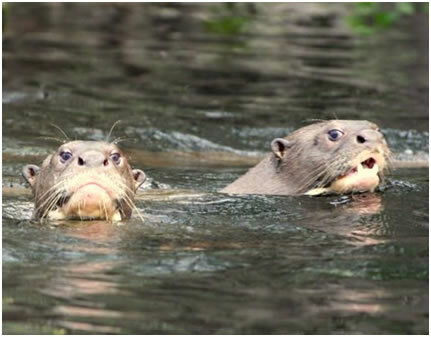 You can see freshwater Boto and Tucuxi Dolphins breaking the surface, Giant Amazonian Otters barking from afar as you invade their territory, Turtles laying eggs on white sandy beaches, multi-coloured birds fighting for the right to make more noise than the Amazon's army of insect at dawn and dusk. Green Parrots will shriek non-stop whenever they see you and Red and Blue Macaws are often seen and always flying in pairs, never solo. Toucans call to eachother from the tops of trees and sound like puppydogs yapping. And if you're lucky, you could even see the occasional Tapir, Capybara, Agouti or wild pigs at the water's edge and even Jaguar crossing the river. Although most Amazonian mammals are nocturnal, many can be seen during the day. 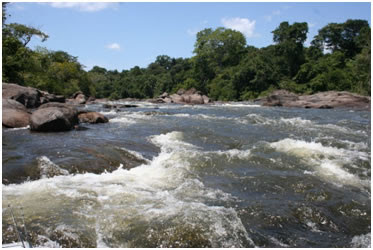 All of our rivers and destinations are chosen with safety and care in mind. Most are either with tannin-stained blackwater or clean whitewater. There are very few biting insects if any in most places and we will NEVER fish in a Malaria zone, although it is always advisable to take Malaria prophylactic pills. We want to open the UK and other European anglers' eyes to the spectacular and relatively unknown fishing available here. Many think it would be too expensive to attempt but we have some destinations that can suit at very reasonable prices and often last-minute deals and discounts are possible. These are all great places for both anglers and photographers alike. But I have to warn you, once tried, you'll be hooked for ever!! Our company www.Amazon-Angler.com provides adventure-seeking anglers with exotic and adrenaline fishing for some of the fiercest adversaries in freshwater. We have specialised in the Amazon for the last 15 years and we take our small elite groups to some of the most fantastic jungle locations in Latin America. This is what fishing dreams are made of, with the most hardest-fighting, most aggressive fish on this planet. We have a dedicated species page on our website http://www.amazon-angler.com/ which covers just a few of our target fish but the list just goes on and on. There are so many different species in the Amazon to catch and we have made it our mission to take our clients out there for the best fishing of their lives.